After doing a full review of what I thought of Zaycon's newest product, their sausage links, in yesterday's article I thought that I'd better give you step by step instructions on how to CAN said links. However, as noted in yesterday's article, I discovered that I could easily can the links raw as well as the innards raw. As a result, since I have dreams of rows and rows of canned ground sausage that I can use in my sauces, calzones, pizza's and even meatballs--yes you can still make meatballs if you're using canned sausage--you just have to have more binders in it than normal--I decided to can the sausage two ways. Raw links and raw crumbles (aka ground sausage). Regardless of which way you want to can your sausage, you'll always want to make sure you have enough clean jars. 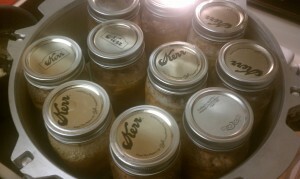 I prefer the wide mouth pint jars whenever I'm canning meats. After my experimentation I decided to do my sausage two ways--in raw links and as ground sausage. The links were WAY easy. 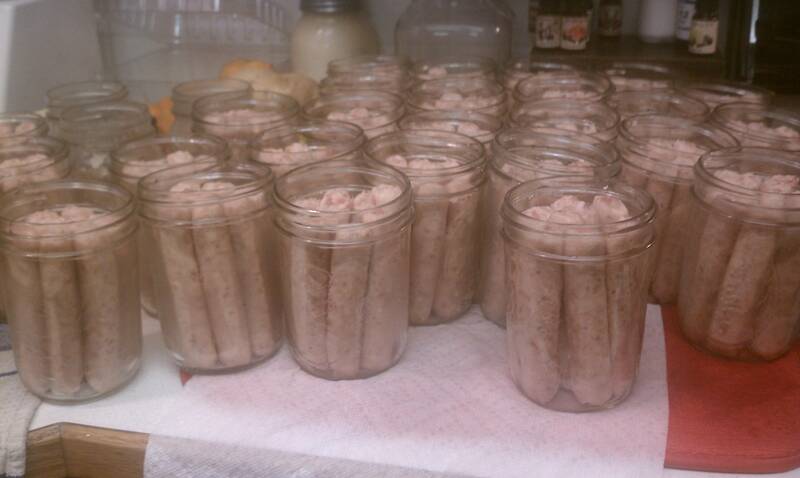 All I had to do was put the raw sausage links in clean pint jars (wide mouth recommended). Wipe off the tops/edges of your jars with a clean, warm cloth. Fill up the pressure canner with water until it reaches about 2/3rds of the way up the sides of the jars on your lowest level in your canner. Allow the pressure to build up so that the steam vents from the top for 5 to 7 minutes--set your timer for this because the last thing you want is to expel TOO MUCH water. Once you've expelled steam for a sufficient length of time, put the appropriate pressure weight on so that the appropriate pressure weight is achieved. 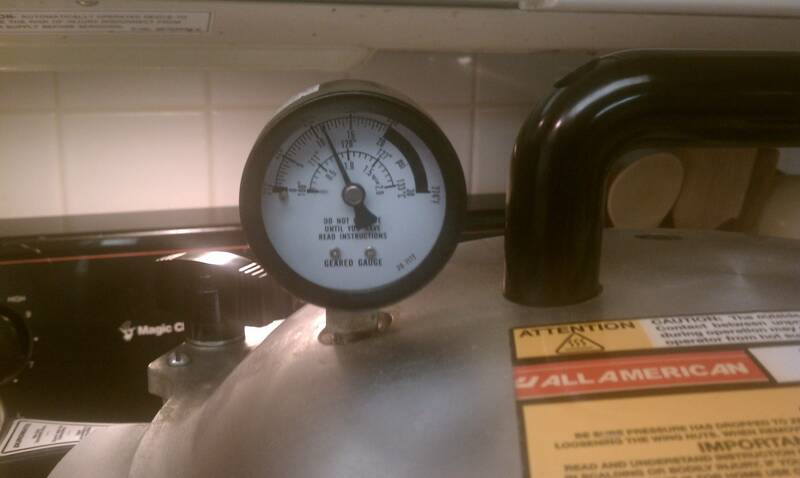 Keep an eye out on your pressure indicator throughout the canning process. You want to make sure that the pressure is maintained. If your weight on top of the vent is making a lot of noise it's allowing too much steam to come out. You want to keep it "simmered down"--yes, that's where that saying comes from. To do that you'll just keep reducing the heat source until you're able to manage and maintain your pressure weight. Once you're at a well maintained pressure, you'll only hear a little rattling about every 3 to 5 minutes. When cooled sufficiently, remove the rings from the jars and wash them in hot, soapy water and allow to completely dry. If they are wet they can rust or corrode, thus spreading such corrosion to your lids. When the jars are completely cooled, check that they’ve sealed properly simply by pushing in on the middle of the lid. If there is any give, it’s not sealed. 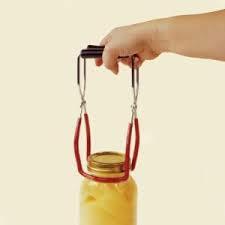 If you discover an unsealed jar, you can put it in the refrigerator and use it within a couple of days. If you discover it within a couple of hours of your pressure canning, you can reprocess it right away but it won’t be as tasty as those you processed just once. When ready to eat, simply warm through for ideal texture and taste, though you can consume the ingredients directly out of the jars as they are fully cooked. I suggest you use pints instead of quarts for safety purposes. You're more certain to properly can the proteins this way. I’m in high altitude so I had to do 15 pounds of pressure at 90 minutes but most areas can do 10 pounds of pressure for 75 minutes on pints. Check your instruction manual for detailed times and pounds of pressure. I only use the All-American Pressure Canner which obviously I can use as a water bath canner AND I can use it as a pressure COOKER too. It’s the best quality canner I can find and since I’m betting my life on its quality and the foods I entrust to it, I won’t cut corners on a pressure canner. It’s worth the peace of mind to me. 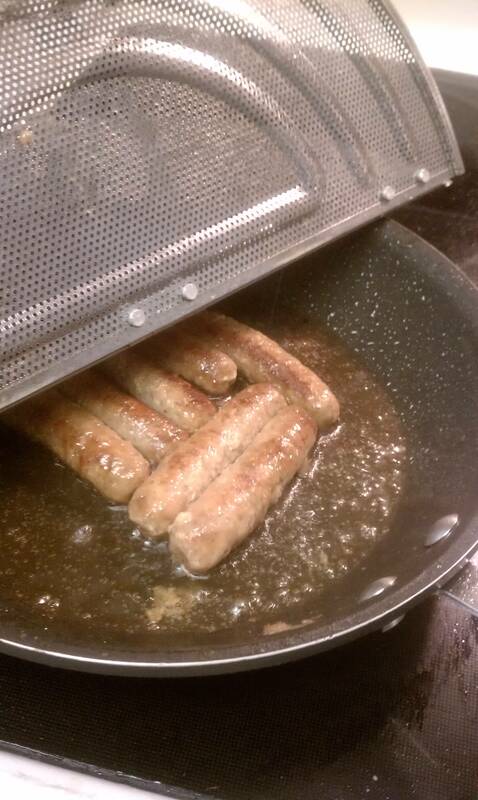 The key to canning sausage is that you DON’T ADD ANY WATER. Some people refer to this as “dry canning.” In my world, dry canning is when I’m canning goods, typically done with a FoodSaver (though some dry can with their oven) It doesn’t need it and there’s no appetizing thing known as “pork broth” in the culinary world, so I really can’t see any reason why you’d want to add water to it. If your meat is soggy from sitting in water like that, there’s no way you can brown it, even in grease. You can see how nicely these canned raw links browned up? You can make your ground sausage into patties and can them in wide mouth jars that way, however, I would suggest you put a layer of parchment paper between each of the patties. Also, don’t add any sage to the sausage before you can it. I didn’t attempt that but I read of several others trying this approach in order to get the sausage to taste better after the canning process. I learned my lesson on that one long ago. Sage gets quite bitter as it sits in pressure canned jars over time. If you’re going to use these instructions on canning your own homemade sausage or some other high quality brand, but you want more flavor such as sage and fennel, go ahead and wait until you’re ready to serve it and then add the additional seasonings. That’s another reason why I don’t season any of my other meats prior to canning—so that the herbs don’t go bitter on me and so that I’m not pigeon-holed into one way of using the protein. Salt is all I ever use on any protein. If you're doing it correctly, you should never have to add anything to get your proteins to taste good when canning them. I’d also suggest that you use wide-mouth jars when cooking proteins as the fat settles to the bottom of the jar and holds the meat in at the bottom so when you attempt to simply pull the link or ground meat out, it breaks. With a wide-mouth jar it’s easier to just slide a butter knife around the edges and simply slide the meat out that way. If you're interested, I've got an instructional YouTube video that I made for canning ground beef. (Just go Here) You can also see the details on canning bacon here and canning chicken here. The fact of the matter is, you can can just about ANY meat you want using this “dry” canning method. I add water to my beef and chicken because I like the broth from the meat marinating in there for years. 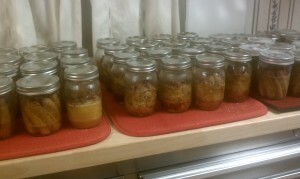 But I found that this “dry” canning method is excellent for sausage and steaks! So give it a try next time the occasion for canning hits you! That's correct. The weight IS the key indicator of your pressure. Mild hissing with a periodic jiggling every few minutes is perfect. Thanks so much for your reply (and I also noticed I misspelled 'aesthetics' in my comment -oops). Good to know. Love your site! Yes, you can find the easy method of how to test your gauge yourself on YouTube. Just look it up on YouTube and you'll definitely find it. It's actually quite easy. I'm new to canning and so am not quite sure I understand your canning raw meat. Is it 'cooked' during the long canning process, or merely preserved and you need to then cook it when you want to eat it? I couldn't tell if you were just browning the sausage links for aestetic reasons or if you were actually cooking them. Sorry if that's a dumb question. Thanks so much for all your valuable info! I can meat this way all the time and love it. I can raw turkey off the bone and just add water and a teaspoon of salt. For sausage links, I lightly brown them - just for flavor - and then add them to the jars. Meat is definitely cooked by pressure canning and, unless you are trying to achieve a type of flavor, does not need to be cooked twice (before canning and then during - really three - reheating). By canning food raw, you keep your essential nutrients contained with the food. I live in NC and our county or state extension office no longer tests gauges. Any other ideas? Thank you for such a clear guide on pressure canning sausages! When I first got my American Canner a couple of years ago after many years of having a Presto, I was nervous about how things worked and called American's customer service a couple of times. They were wonderful and helpful. One thing a representative told me still confuses me. She said the pressure dial is only a guideline and cannot be counted on completely for assuring you are staying at the right pressure. She said the metal weight was what you needed to pay attention to and that it should be hissing, jiggling, etc. the correct number of times. She said the weight tells you that you are staying at the right pressure. I wondered if I got misinformation or was not understanding something correctly. In the meantime and a few hundred jars later, I watch the pressure gauge and listen for the jiggle both. What do you say Kellene? Go to youtube and find how you can test it yourself. It's not that difficult, I assure you. Steaks are easy. You just cut them to fit the wide mouth jar, stack them with parchment paper in between, and then dry pack can then just as you do the sausage. I'd go 90 minutes at 15 pounds for high altitude, 10 pounds for other areas. Good luck, dear! Thank you I will put it in my book of need to know. A County or State Extension Service Agent should be able to test your gauge or weight for you. Most will do it free or for a minimal fee as they are affiliated with the State Agriculture Department or Agriculture College. If a person lived in an area where the weight could not be re-calibrated, would it not be not be easier to purchase an addition one and send the old one to the company for an inspection? I do not believe we have such a facility in our area. Loved the article and so many different uses for the meat. Someday give us lessons on steak canning, please! I have the same canner that you have and my instruction book says the weight should jiggle 3 to 4 times a minute. In these instructions you say every 3 to 5 minutes. Can you explain the difference? (I know that you can quite a bit so I am wondering if this was something you learned along the way). You'll have to use your browser print option and print the whole page. We have purposefully written code so that it's not as easy for dishonest individuals to violate our copyrights. It seems that there are plenty of untoward persons who are completely OK with copying and pasting my work to their page and taking credit for it. I used the wide-mouth pints and fit 9 or 10 in each one, depending on how fat they were. So excited at your new journey! Woohoo!! Glenda, you certainly don't need my permission to determine what method you'll use for your canning. :-) I'm quite confident with the safety and success of the methods that I've used. If you want to adhere strictly to USDA guidelines, then so be it. (Yeah, the USDA--the same persons trying to tell us that we can't can butter, wax cheese for "health reasons" and yet GMO is "harmless" as are the 21 different chemicals that they allow farmers to use and still certify their produce "organic." I'm so glad you set the record straight! :) I REALLY prefer not having to brown the meat beforehand, I just didn't know if for some reason Ball folks felt it wasn't as safe . (That just shows how paranoid we've all become! That said, I agree the UDSA folks really are maddening with all their reg's that just mean more food controls ie GMO, "organic" etc. For the record, I got a buy on pork sausage this morning and I'm using your wonderful method for this batch! I've finally learned my lesson: "Don't believe a thing the government tells 'ya!" AWESOME! Then when you're ready to use it in your recipes, when you brown it up, it will look JUST PERFECT! I have to laugh every time I see USDA comments on canning butter. They always say it isn't a healthy thing to do, but then say, "but it's never been tested". LOL! TEST IT! I have been canning butter for years and have used it two to three years later. They say the same thing about cheese. I would like to can store bought italian sausage. We use it in spaghetti sauce. Do you think the spices might be too strong once canned? Thank you. I have canned commercially seasoned and ground Italian sausage several times. I did brown mine a bit first to get some of the grease off, but I doubt it changed the taste much. I didn't have any problem with it becoming strong or bitter tasting due to seasonings. I actually attribute that to the fact that most companies are too cheap to use many seasonings in anything these days. I have started making my own sausage after I accidentally planted fennel instead of dill. I had so much I didn't want it to go to waste, so I started making my own Italian sausage. It's great because I can control the quality of the meat and the amount of seasoning. Then, I moved on to bratwurst, wiesswurst, breakfast sausage, etc. It's so much fun and my friends have been asking me to share. It's not hard to make and is very economical when pork and beef go on sale. I grind it myself with my KitchenAid. You can get your beef and pork from Zaycon for MUCH cheaper than sales at the store--especially with your earned Zaycon dollars that never expire. 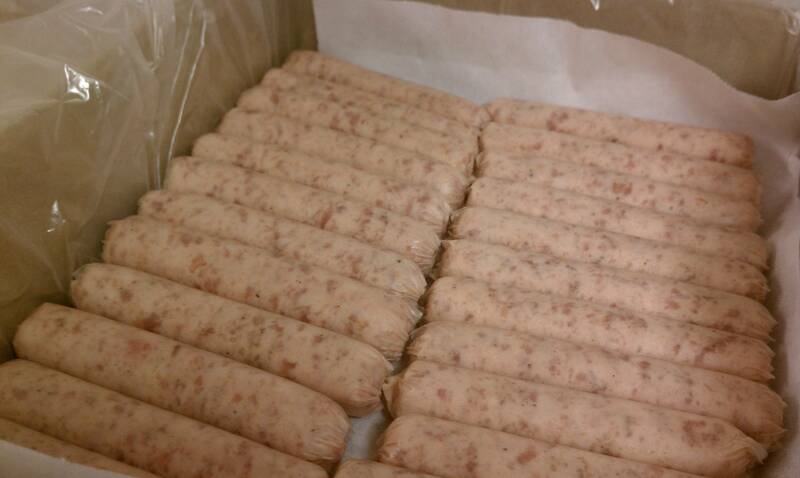 This sausage article got me wanting sausage! I've never tried canning it but I will now. I wonder if the bulk sausage will be just a lump when it is finished (meatloaf like)? Something that you have to chop up before you use it? On another subject, could you please sometime discuss BPA in store bought canned foods? I've heard so many scary things about it but have cooked from cans all my life. I have an awful lot of store bought cans of fruits and vegetables in my storage. You always give us a sensible viewpoint. What is your opinion on the BPA scare? I don't want to give up the cans I have stored or feel like I"m hurting my family when I use them. Rose, just put "Zaycon" in our search bar here and you'll find detailed information about them AND how to enroll (and of course use my referral link, please. https://www.zayconfoods.com/refer/52652 All you're doing is enrolling to get their monthly e-mails. I'll let the articles tell you the rest. Rose, as noted in the article I did links (with the casings) links without the casings, and links pre-cooked a little bit. The article just before this one might actually be the one that says all that, I get things confused sometimes. Oh, and I forgot to ask. I have never heard of Zaycon before. Can you tell me more? Are they really that good of a buy and where do you find them? Rose, I checked on Zaycon and a case of boneless, skinless chicken breasts were $1.79 a pound for a 40 lb. box. If I bought a case at Sam's Club, their case price is $1.69 a pound. If you don't buy by the case, Sam's price is $1.88 a pound. I didn't check prices for other meats. If you don't have access to Sam's or Costco, this would be a good deal. Let's also remember that this is a SIGNIFICANTLY better quality of meat at Zaycon. As I've said repeatedly, it would run at least $4 a pound for anti-biotic and hormone free boneless, skinless chicken breasts elsewhere PLUS Sam's doesn't give me money to pay towards anything else they sell whenever I send a customer there--let alone EVERY time that that same customer goes back and purchases something! Good grief! I've received no less than 600 pounds of meat FREE over the past year as a result of their referral program! It just doesn't get any better than this! I keep trying to tell folks that I've done my homework, but some people just have to make their mistakes their own way. Oh well. I love canned sausage but have only semi cooked up patties before canning and have never done links. Do you leave the casing on? We love canned meats, too, very tender and convenient. Thanks for your info. And Happy Easter! I, too, have a glass top stove. Though I have a much smaller canner, it still weighs alot when full. I had heard and read, even in the manual LOL that you should not use on glass tops....but following Kellene's lead, went ahead and did it. No problems at all! On my fouth batch and I do not expect any problems. Thanks Kellene, for ALL you do to keep us informed! Obviously, if I'm using it on a glass top stove, I'm doing so because it's fine. Old ones that were part of the first generation?--not good. Now? Just fine. I see you use the American canner. I have a glass top stove also, but it says not to use that canner with it. I guess you haven't had any problems. I want one so bad but I'm chicken that my glass top will break. Any insight you can give me would be appreciated. Just a thought on cooking surfaces: I had a VERY old American canner but ordered a newer model when a good buy came along. Somehow I ended up with a model that is quite a bit taller than the older model. This one holds up to 14 QUARTS. That equals a lot of weight, even without the needed water for the canning process. My solution was to purchase a Camp Chef, 2-burner, butane stove which I set up in my garage. It was between $100-$150 and breaks down in a jiffy, (legs unscrew) and the gas burner rings are much larger than on my cook stove in the house. This bigger burner size delivers more heat in less time. It sits lower than my house cook stove and is easier to load/unload, add liquid etc.The processing time is the same as always, but it's much quicker to reach the purging stage. This was initially purchased as part of our preparedness gear and has served me SO well with pressure canning large quantities. It really has been a lifesaver. I pressure can meats all the time- pork, beef, chicken, and rabbit. Lots of rabbit. And almost all of it is done as raw-pack, no added liquid. My only complaint is the non-aesthetic look they all have after. However, one taste, and it doesn't matter any more- its fantastic! I am in cape town SA. I got a canner in January with no manual. I have contacted the company numerous times and still not been able to use my canner. 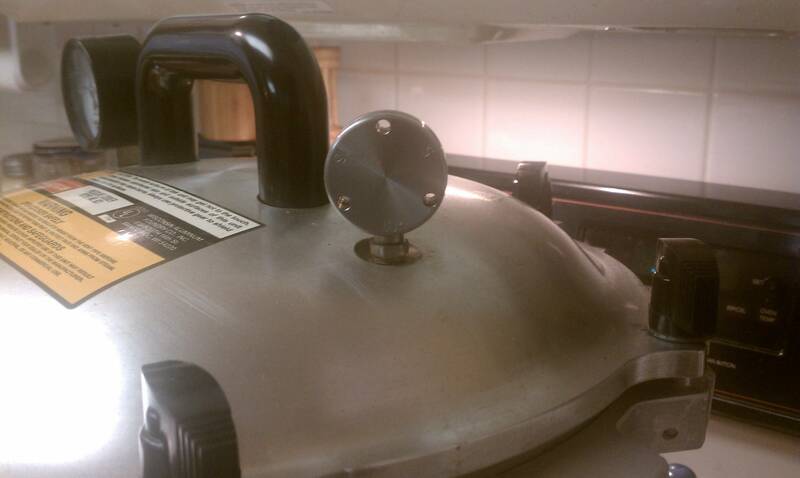 It is a basterfield pressure canner. It has a gauge and one weight.my problem is if the recipe says 10lb for 60 mins, what pressure does that mean on the gauge? I am quite desperate for help. It would be the 10 pounds of pressure. I thought, "Easy! --just Google for an online manual!" Well, I guess you probably tried that @ the Basterfield website, and there is nothing there. Nice-looking canner, though! I would guess that most general canner instructions would work for you; there are lots of those on the web. Find something similar to yours and go for it; it's really quite easy! Good luck and enjoy your new canner. 1. The amount of water being consumed during the purging and canning process is minimal. If you have a concern about water consumption and the canner running dry, measure the water before and after a canning process. Extra water won't hurt, but it takes more time and energy to bring extra water to a boil. 2. Don't skimp on the purge time, prior to putting on the weight. Most manuals recommend 10 minutes once you get that first wisp of steam coming out of the vent that the weight sits on. This purge time is important, as if you don't get the air out of the canner you will have the correct pressure but not the correct temperature during your processing time. This has to do with saturated steam and the temperature is only valid when there is no air in the system. I've noticed when you have information like this one I try to highlight and copy so I can print it and have it when I need it, but it doesn't highlight at all. Do you have a way that it can be printed? Would appreciate keeping this for the future. Also loved your hamburger canning and plan to do it as soon as I am able (I'm out of the country serving a mission with my husband), but excited to try a few things I haven't done yet and really enjoy all your information and than you for it. 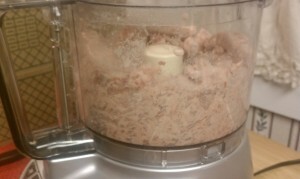 "Grind fresh pork in a food processor or meat grinder. Season pork with salt, black pepper, cayenne pepper, thyme, oregano and basil in any combination (Note: do not use sage to season sausage as it may become bitter.) THEN shape ground pork into patties or 3-4" links. Cook until slightly browned. Drain. Pack hot sausage into hot jars leaving 1 inch head-space. Ladle hot broth over sausage, leaving 1 inch head-space. Remove air bubbles. Adjust two-piece caps. Process pints 1 hour and 15 minutes, quarts 1 hour and 30 minutes at 10# pressure in a steam-pressure canner." inch head-space." Firstly, all ground meats in this book are to at least be seared before bottling. That said, I've always added liquid to my ground beef and turkey when processing after browning the meats first, per the Ball book. I like your method better but I can't explain the difference in the finished product between "lightly browned" and packing raw. Can you help me to better understand? One final note: They do not even HAVE directions for canning butter, hence my assumption is they don't want to even begin to discuss "dairy"! But, we KNOW it works! Thank you for your had work on our behalf! I'll have to wait for the sausage the next time around as chicken is the one available from Zaycon for our area. Thankfully, hubby helped his Mom can (everything) when they lived on the farm which is a big help for this "nervous-ninnie":) Dad raised and butchered all their hogs, Mom canned the sausages (in patties) using the same process you're using! Hubby was wondering how many sausage links per pint jar? I couldn't join with your website or your name either. Sent them an amail.......it's been 2 days and I still havn't heard from company.............Thanks for all I learn from you! Put in "PrepPro" as the referral source. That should help. Kellene, I have thoroughly enjoyed all your help and videos. I have a question about canning...is it possible to can meat that is frozen or do you feel it is always better to thaw completely first. I have a considerable amout of meat in my freezer, mostly chicken, that I would like to can, I'm just not sure how much to place in each jar. (like will a wide mouth jar hold 4 or 5 boneless thighs), that type of thing. Thanks for your time and I hope you're feeling well. you most definitely need to thaw the food you're canning first. Sometimes I throw that stuff in my pressure COOKER and then can it after I've thawed it and cooked it. But otherwise I just allow it to thaw. Please put in the word "Foodsaver" in the search bar. Also look at our YouTube.com/preparednesspro site and see my FoodSaver video. I answer your questions that way. I think that oven canning (which is what you're describing as opposed to "dry canning") is counterintuitive for a long shelf-life. You shouldn't expose most of the items you've mentioned to ANY heat, let alone the temps you discuss here. After washing and drying your full canning jars, try coating the lids with a slight amount of vaseline. It will protect the metal from corrosion or rusting. Of course if you write the date etc on the lid, do that before applying the vaseline. Brian, I hope I don't offend you for stating this, but I would wholeheartedly discourage anyone from doing this. Vaseline is a petroleum product. You definitely don't want it in your foods. As such, because it's a petroleum product, it's also a solvent, which if used over time, can increase the deterioration rate of the lids. Instead, you might want to consider non-petroleum product options such as KePeg, jojoba oil, etc. Of course if you ensure that your environment for storing the jars is DRY, then you shouldn't have a rusting problem. my father use to make Italian sausage an put it in casing and he would brown it really good then put in the grease then can them that way have you tried this an really how safe is it doing it this way? Well the USDA will tell you "no" but there are a whole lot of old times who LIVED by this wisdom and I"m one of those people who DOES it. Canning sausages for 1st time. 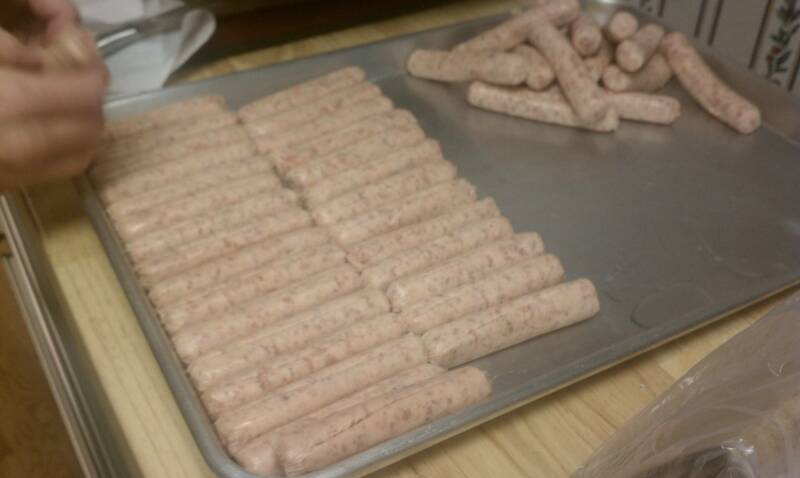 My grandmother taught me to raw can chicken... so I like the idea of raw canning sausage ... question, Im slightly confused, can I leave the natural casing on the sausage or take it off for canning? You can leave the casings on. I understand what you are saying about adding water not of any benefit, but I am wanting to can my homemade german style brats and was thinking of poaching them in beer first and then adding the beer I poached them in to the jars before processing them. Do you think that would still be bad? I want to have the beer flavor in them so I can just pull them out and brown them on the grill like I do now after poaching them. I'm a really bad person to ask this question to, I'm afraid. As I don't partake of alcohol products, I have no idea about storing canned items in beer, however, my gut instinct says "no." Wine may taste better while it ages in glass, but I don't think that beer would. As such, what I would do is DRY can them in the pressure canner, meaning, add no additional liquid once you've poached them properly. Hope that helps. We ordered our sausage from Zaycon (of course) and since it will be arriving this week, I said to hubby.... I have to check-in with Kellene to refresh my memory of the how-to's for canning it and totally pleased to be reminded that it will be Ez-Pz to can our sausage too! (Also surprised that my last communication was "way back" in 2013! Just wanted to touch base with you, say Hi and again thank you for all your time and effort spent/invested in teaching us all how to can, especially our Zaycon meats! Our bottled chicken and gr-beef, are OurFastFoods! :) So thankful as the past few years have been a bit physically challenging and the ease of whipping up something healthy and quick from our own kitchen is, for sure a blessing and luxury! Appreciate SO much the volume of wisdom you have shared. Stay safe and God Bless !! Always great to "touch base again" with ya! :-) Good luck with your Sausage!!! YUMMY!